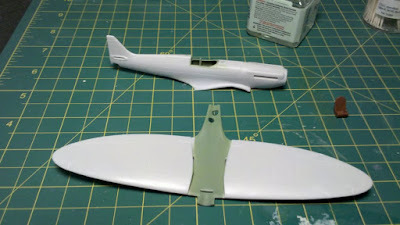 So what happened to this Spitfire that was oh so close to being finished in September 2010? Why haven't you seen a gallery of the finished mode? Well, let's just say that dumping an airbrush cup of lacquer thinner on an almost completed kit doesn't do it much good. Melted plastic anyone? How did this happen? To quote Danny Whitten "I don't want to talk about it." Somedays when it comes to modeling, I just feel cursed. Luckily the Airfix Spitfire XIX is a pretty cheap kit, so I have recently started a replacement. Here we are after a few days work. This is a pretty nice kit and progress has been swift. Hopefully by the end of the weekend it will all be in one place and I can start thinking about paint. No matter what happens, this time I'm using acrylics and the lacquer thinner will be put far, far away. Heck no more hardware store lacquer thinner for me, I'm sticking to the plastic safe Tamiya stuff from here on out. A commentator asked a few days ago about B-17 kits, so I thought I would put up some RCAF B-17 photos. 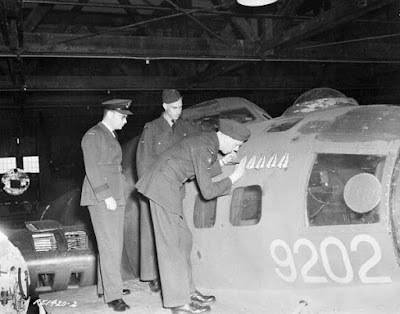 It is so typically Canadian that RCAF would operated the most famous US bomber of World War Two as a mail plane, but that is exactly how 168 (Heavy Transport) Squadron out of RCAF Rockcliffe used the Flying Fortresses. 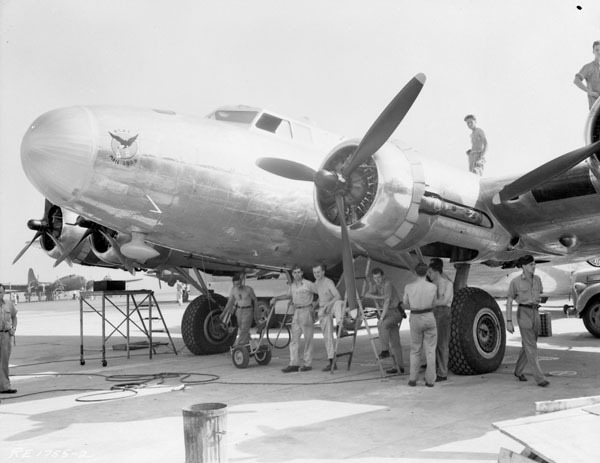 The six aircraft fleet was a mix of second hand B-17Es and B-17Fs and were taken on strength as bombers with their armament removed painted in olive drab over neutral gray camouflage. The aircraft were modified in RCAF service to make them more useful mail planes and stripped back to natural metal. This photo is purported to be the unloading of the first load of airmail flown by B-17 for Canadian soldiers in Foggia, Italy, December 30, 1943. 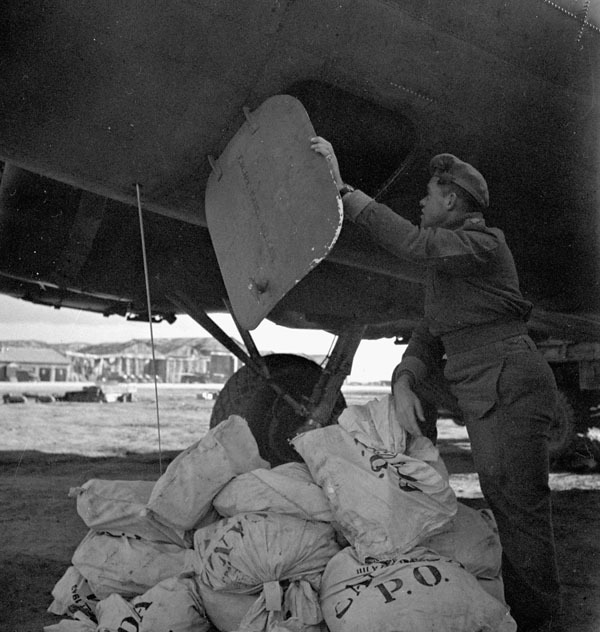 The caption for this photo states "Leading Aircraftman Freemantle paints a mailbag symbol to indicate another overseas mail flight completed by Boeing Fortress IIA aircraft 9202 of No.168(HT) Squadron, R.C.A.F., Rockcliffe, Ontario, May 9, 1944." Modeler's Note: There are three good choices for a 1/72 B-17. The old Hasegawa kit is nice, but probably not a bargain if purchased in a new Hasegawa box. It has raised panel lines and somewhat sparse detail, but still looks good. The early 90s Academy kit has better detail and recessed panel lines, but I understand there are some issues with wing dihedral. It sure looks nice in the box though. The recent Revell B-17G has stunning detail, but some odd mistakes with the height of the mid upper turret and the wing intakes. The biggest issue is the engraved trenches on the nose. Even I, as a fan of Matchbox kits, think something needs to be done to the panel lines...use the above photos to gage if you want to fill the trenches or not. I know I will! Now that I've seen two issues, I think I can safely comment on the new Model Aircraft Monthly...no Military Aircraft Monthly...no Model Aircraft magazine from SAM Publications. No need to worry about a name or branding in the magazine publishing world, eh. Now called Model Aircraft...at least for this week...the premier April issue was heavy on the MiG-21 with a nice 1/72 kitbash of the Fujimi and Zvezda kits. 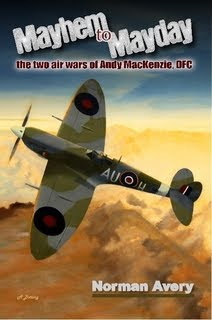 Also in the DSS realm was an article on early Spitfire colours with many many Airfix Spitfires included. 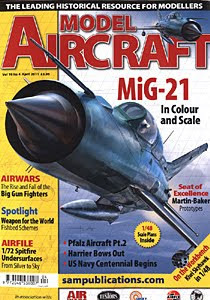 Devil Scale modeling was focused on a Hobbycraft A-4 Skyhawk, and the real airplane section featured the fixed wing products of Martin Baker, some Pfalz biplanes, an article on the ME-410, and the inevitable Harrier retirement and Centennial of Naval Aviation photo features. Overall not bad, though there are way too many typos and spelling errors and the six page Kit News section listing of new products seems superfluous, much better suited for SAMI. 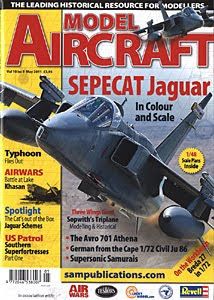 The May issues features Jaguars, with a nice Devil Scale build of the Airfix kit by Bill Clark. 1/72 scale features include a South African JU-86 and the AZ Breda 27. The Roden 1/32 Sopwith triplane is paired with a short feature on the real Triplane along with some scale planes. The esoteric history feature of the month is on the Battle of Lake Khasan, there is an article on the Avro Athena, and finally there are nice photo features on the Japanese F-1 and F-2, and some RAF Typhoons going off to war. The proof reading is better, but not perfect and again six pages are wasted on the Kit New section. But issue two is an improvement on issue one. 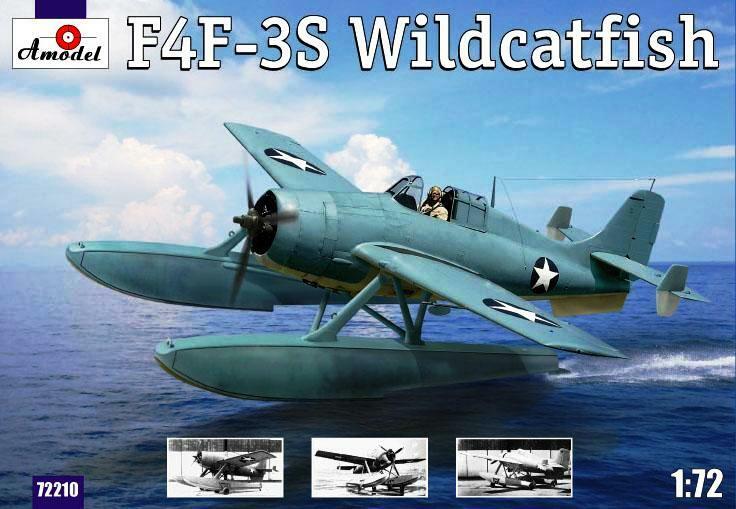 I don't know what it is about the Grumman Wildcatfish that attracts me so much. Sure I am a Wildcat fan, but no Canadian service ever operated the Wildcatfish. Maybe it is just the irony of putting on fighter on floats...and more, so putting a pudgy fighter on floats. Anyway, I'd always wanted to build a Wildcatfish, but I'm not sure that there were many options in 1/72. That has now changed. Boxed by A-Model, I think this kit originates from their Master 44 design bureau. (Well at least that is what the sprues say.) The kit has four grey sprues and one clear sprue. The molding is quite well done for a short run kit with small sprue attachment points and little flash, but the detail is crude. In fact this kit looks totally 1970s. The first sprue includes the four floats which have almost no surface detail. The wing spure has nicely scribed lines, a few engraved rivets, and restrained fabric detail. The fuselage sprue also contains the engine and cockpit details. Again, the fuselages parts are nicely done, but the engine and cockpit detail is poor. Cockpit detail consists of a floor, small instrument panel, control column, backrest and seat bucket. Not accurate and not well done. The propellor is ok, but the engine would embarrass 60s Airfix kits. The last sprue contains the beaching gear and float supports. Again, pretty well modeled with minimal flash, but crude detail. The clear canopy looks funnily shaped to me, is thick, with poorly defined frame lines and some dimples. Not at all state of the art. Finally, you get a small decal sheet with 6 stars for the one option in USN Blue Grey over USN Light Grey. Oddly the instructions tell you to paint the underside white rather then grey. Nothing about this kit is state of the art, except for the price. At almost $30, you better really want a Wildcatfish and be prepared for a crude 70s style kit. Maybe the best option is consider it a conversion and kitbash it with a Hasegawa Wildcat, or at least steal an engine, prop, and canopy from Hasegawa and add a True Details cockpit. But that would be one expensive model. So now what? 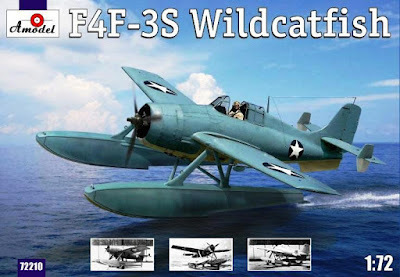 Do I build it as it was tested in Bethpage, or do I just throw caution into the wind and build a what-if Canadian Wildcatfish. Because, really, the RCAF should have purchased them to defend Canada and allow the senior pilots to go on fishing trips in style.